The Bizzard at DQ is so wrong it feels right. I grew up going to Dairy Queen. Nothing says summer like the treat of ice cream. I haven't been so overly strict that my family hasn't enjoyed ice cream, just not DQ's until recently. 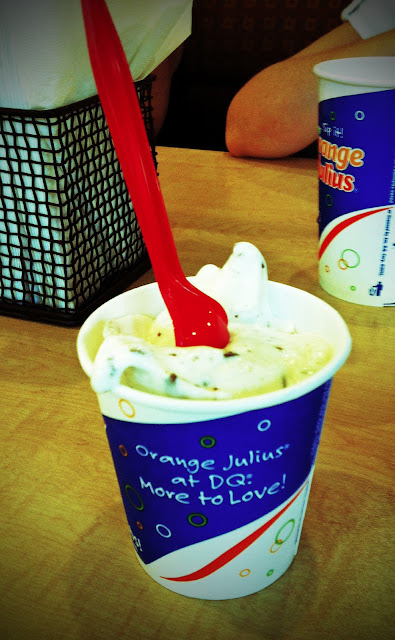 My daughter had a DQ Blizzard when visiting with a friend and reported how she loved it. This brought back the memories. So when the unit had finished dinner we set out -- I made everyone walk about 3 miles, to make sure only those truly committed to the experience got the treat. I realize I am ridiculous (but I accept who I am). I had a Blizzard with Oreo blended into it and in a flash I was back in Minnesota being bitten by mosquitoes. Still, this was a good memory. Despite my Michael Moore-ish tirades against "the system" I have nothing to counter this delicious dessert item. In the end we all break. I suspect before the summer is over I will have forfeited any right to ever speak negatively about high fructose corn syrup. Get thee to a Walmartery!